If you’re looking to take a professional PADI dive program than Trawangan Dive is now the place to do it. Trawangan Dive has long been one of the few PADI 5 star dive centers in The Gili Islands, Indonesia. During 2013 we have set out improving all of our professional level courses and programs, so as to set ourselves above the rest; providing professional level training over and above that required within industry. Our dive master program is run alongside our regular daily diving schedule allowing divemasters to get first-hand experience of the industry working alongside our seasoned PADI Instructors and dealing directly with our customers. Divemasters will establish their precise role within the provision of modern day recreational dive training and will learn how to play an integral role within a team of highly experienced instructors. We hold regular training workshops allowing divemasters to realize their true potential and unlock a range of newly learnt skills. Any diver wishing to take their divemaster program will be given every opportunity to progress within the dive industry. Our Instructor Development Course has also been completely revamped over the course of 2013 and again our schedule has been modified in a way to provide some of the best PADI instructors in industry. Over the course of 2013 Trawangan Dive has been reclassified as a PADI Career Development Centre (CDC) meaning that we now provide the highest level of professional dive training available and are pleased to say the only PADI CDC Center in the Lombok region. We have also now employed a two new PADI Course Directors who are not only able to provide the best professional training available, but can also give some great industry advice having worked in a multitude of location around the world bringing prospective instructors the perfect mix of first class training combined with an in-depth knowledge of the recreational dive industry and its expectations. Our MSDT program now offers the full range of specialties and can be tailored to those which you will require for industry in the particular area you will be working. 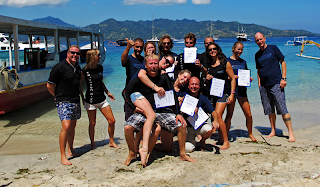 Trawangan dive is very proud of all of its achievements over 2013 and would like to thank its entire staff for the continued success in becoming one of the best professional and no professional dive educators in Indonesia. then don’t hesitate to contact us on idc@trawangandive.com or info@idc-gili.com.